Add a new flavor twist to your holiday cookie platter with these intriguing, orange-scented five-spice cut-out sugar cookies. Combine butter and sugar in a medium bowl. Using an electric mixer or wooden spoon, cream together until light and fluffy. Beat in egg yolks, one at a time. Stir in the five-spice powder, orange zest and salt. Then stir in the flour. Continue to blend just until the dough comes together and is evenly mixed. Divide into three flattened balls and wrap in plastic wrap. Chill dough for at least 3 hours or overnight. Preheat oven to 350ºF (175ºC) with oven racks in the lower and upper thirds. Butter two baking sheets. Work with one ball of dough at a time; roll out to 1/8-inch thickness between sheets of lightly floured wax or parchment paper. Cut into shapes and place on cool, buttered cookie sheets. Work in batches and keep the remaining dough chilled until ready to cut. For the best defined shapes, chill the cookies on the baking sheets before baking. 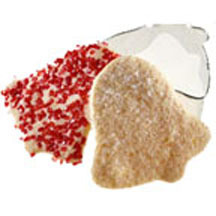 Sprinkle the tops of the cookies with decorative sugar. Bake until bottoms just begin to brown, about 8 minutes. Transfer to a wire rack to cool. *Five-spice powder is available in Asian markets and most supermarkets.